I just realised it's almost six months since I started growing a moustache for global fund-raising crusade Movember. It's had a few trims since then, but it's still alive and well on my face. It has, quite literally, and in a very real sense, grown on me. 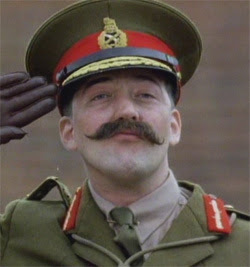 In terms of classification, it's probably best described as a Lesser Melchett. It serves numerous purposes – absorbing milk, keeping my top lip warm, offering something to twirl when deep in thought – but most important of all, it still raises money for the Prostate Cancer Charity. Rather amazingly, funds from Movember have enabled scientists to construct a complete genetic map of prostate cancer, which greatly expands the understanding of how this disease works and will eventually lead to better, more personalised treatment. Good work, boffins. So, if any of you have any spare cash floating about, please consider donating what you can to Movember. Using the magic of the Internet, you can donate as much or as little as you want. Even a quid, a single nugget, from each of you fine people would very quickly pile up to an amazing amount that would i) help fight a horrible disease, and ii) make my be-twirled facehair incredibly proud. Just smack your mousey arrow here.